This Saturday, starting at 22:00 CET, the grand final of the Festival da Canção 2019 takes place in Portugal. Eight artists take part and aim to represent their country in Tel Aviv at Eurovision 2019. Here we serve you a preview for the final in Portugal, the country that won the Eurovision Song Contest in 2017. Is there anyone in the competition that has a shot for the gold in 2019? Here are the main candidates to win the Festival da Canção 2019. Arguably, NBC is the favourite to win FdC 2019. He was the winner of the second semi final in a convincing manner. He ended up with 22 points, 12 from the televote and 10 from the jury. Good vocals and a good stage performance, being able to ‘grab the camera’ and connect with the viewers at home, NBC would be worthy of representing his nation in Tel Aviv. Conan Osíris has a very a-typical Eurovision song. “Telemóveis” is unconventional, to say the least, and won the televote in the first semi final. Conan only got seven points from the jury, but perhaps they will act different, now that they know what a crowd favourite this has become. Conan gives us a stunning show, wearing a gold mask, to symbolise the Egyptian god Osiris. The runner-up of the second semi final was Surma, who won the 12 points from the jury. 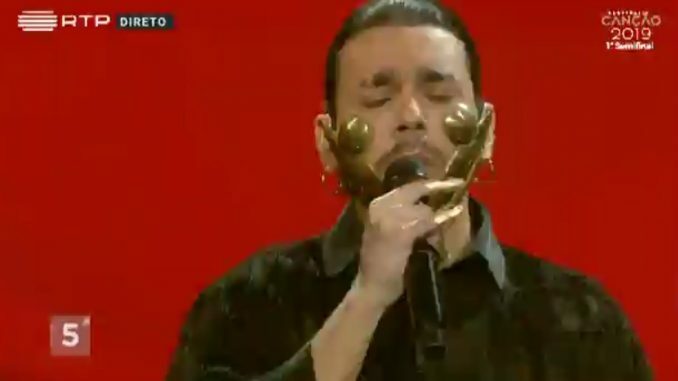 But beware, ‘Pugna’ was a non-qualifier in the televote, receiving only 6 points. And such discrepancy is not something you want at Eurovision. Ana Cláudia – “Inérci” – This non-qualifier in the televote (5 points) of semi final 1 was saved by the jury, finishing in third place in their list.